The Icon of the Mother of God, named the "Sign" ("Znamenie"), images the MostHoly Mother of God seated and with prayerfully uplifted hands; at Her bosom, against the background of a circular shield (or sphere) –in blessing is the Divine Infant – the Saviour-Emmanuel. 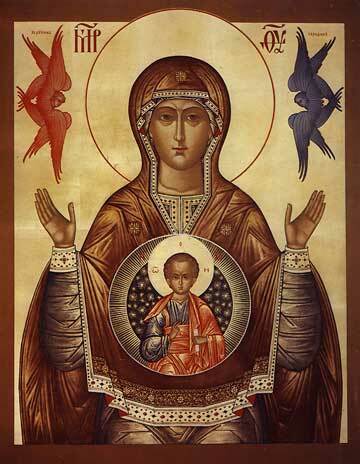 Suchlike depiction of the Mother of God is regarded as among the very first of Her iconographic images. In the mausoleum of Saint Agnes at Rome is a depiction of the Mother of God with hands outstretched in prayer with the Infant-Christ sitting upon Her knees. This depiction is ascribed to the IV Century. Moreover, there is known an ancient Byzantine image of the Mother of God "Nikopea" from the VI Century, where the MostHoly Mother of God is depicted sitting upon a throne and holding with both hands before Her an oval shield with the image of the Saviour-Emmanuel. Icons of the Mother of God, known under the name "Znamenie-Sign", appeared in Rus' during the XI-XII Centuries, and were called such after a miraculous "Sign" from the Novgorod Icon, which occurred in the year 1170. In that year the allied forces of Russian appanage princes, headed by a son of the Suzdal' prince Andrei Bogoliubsky, marched to beneathe the very walls of Great Novgorod. For the Novgorod people the only hope remaining was in the help of God. Day and night they prayed, beseeching the Lord not to forsake them. On the third night the Novgorod bishop Ilia heard a wondrous voice, commanding to be taken out from the church of the Saviour–Transfiguration on Il'ina street the image of the MostHoly Mother of God, and to carry it about on the city walls. When they carried about the icon – the enemy let loose at the church procession an hail of arrows, and one of them pierced the iconographic countenance of the Mother of God. From Her eyes trickled tears, and the icon turned its face towards the city. After such a Divine Sign there suddenly fell upon the enemy an inexpressible terror, they began to strike at one another, and taking encouragement from the Lord the Novgorodians fearlessly gave battle and gained the victory. In remembrance of the miraculous intercession of the Queen of Heaven, archbishop Ilia thereupon established a feastday in honour of the Znamenie-Sign of the Mother of God, which down through the present all the Russian Church celebrates. The Athos priestmonk Pakhomios the Logothete, present at the festal celebration to the Icon in Russia, wrote two canons for this feast. On certain of the Novgorod Icons of the Znamenie-Sign, besides the Mother of God with the Praeternal Divine-Infant, there were depicted the miraculous occurrences of the year 1170. For 186 years afterwards, the wonderworking icon remained situated in the selfsame Saviour-Transfiguration church on Il'ina street. But in 1356 there was constructed for it in Novgorod a temple in honour of the Znamenie-Sign of the MostHoly Mother of God, serving as cathedral for the Znamenie-Sign monastery. Numerous copies of the Znamenie-Sign Icon are known of throughout all Russia. Many of them subsequently also were glorified by miracles in their local churches, and were then named for the place of the appearance of the miracle. Suchlike copies of the Znamenie-Sign Icon are the icons of Dionysievo-Glushitsk, Abalatsk, Kursk, the Seraphimo-Ponetaevsk and others.